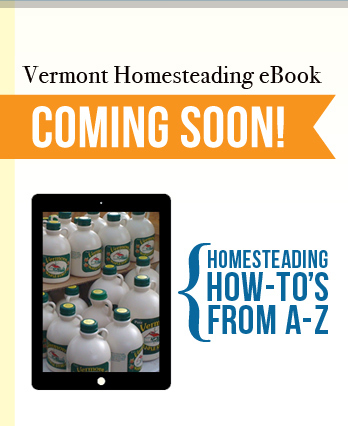 We are in the process of putting together a series of eBooks on Vermont Homesteading. Our first two projects are nearing completion on the basics of raising and caring for sheep and one for goats. Both eBooks include a detailed guide to lambing or kidding as well as a home butchering and processing step-by-step pictorial, with a follow along video, and a few of our favorite recipes like making mutton jerky. Although we have been raising our own food for decades, we have been working our land here in the Northeast Kingdom (NEK) of Vermont since 1998. We have been working on the eBooks while gleaning from past experience and learning new things as well. We have found over the years that many people, ourselves included, learn best from following directions that include how-to photographs along side them. So, over the years we have taken tens of thousands of photographs and written many articles to go with them to share with others. Our goal was to help those who may be just starting out or continuing to develop their land, to bring it to a place that it starts giving back and becomes more self-sustaining. We are planning eBooks on Butchering a Beef; Butchering a Pig; Poultry Care and Processing; Gardening & Tending Berries and Fruit trees; Preserving Your Harvests; and Homestead Building Projects. We have taken pictures of so many projects we've worked on and written articles on; building a bread oven; establishing a bee hive and extracting honey; building raised beds to increase your yields and how to harvest and preserve what you've grown; braiding onions and garlic; making maple syrup; raising poultry and processing your own birds; sexing a rabbit; even making home-made diapers for babies; along with many other useful and beneficial homesteading activities. Each volume will become available for purchase as it is completed, so feel free to check back with us on it's completion. We hope that these eBooks will help others do some of the things they've dreamed of doing but have been afraid to try. To be able to learn from some of our mistakes as well as our accomplishments and enjoy working the land you love.